This past fall, a constituent of Calgary Midnapore contacted MP Stephanie Kusie after learning that the Honourable Bill Blair, (Minister of Border Security and Organized Crime Reduction) had neglected to include Calgary in the “Reducing Violent Crime: A Dialogue on Handguns and Assault Weapons” consultations taking place across the country. Not only was Calgary excluded, it also became apparent that entrance into these meetings would be by invitation only. 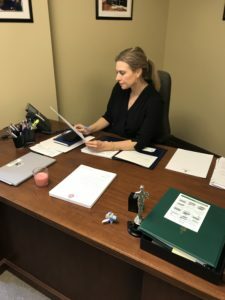 Concerned that stakeholders in her constituency would not be fairly consulted on impending legislation that could directly affect them, Stephanie decided to take action. In mid-October, she sent a formal letter to Minister Blair, requesting he include Calgary, a city with a considerable number of gun owners, in his consultation tour. As a result of Stephanie’s advocacy, she received a response from the Minister’s staff in early December, inviting her to assist in the coordination of an event in Calgary sometime in January 2019, by way of providing the names and contact information of interested participants. Even though Minister Blair’s office could not provide details on a date or a venue, Stephanie immediately began contacting those who had written to her on this issue, to obtain their permission for their personal information to be provided to the Minister. A few weeks later, January 23 was put forward as the expected event date, however there was still no time or place confirmed. Calls and emails continued to pour into Stephanie’s office from people both in and outside her riding eager to have the opportunity to have their voices heard on this issue. After submitting multiple names to Minister Blair – and advising that the list of interested parties was growing quickly – Stephanie offered to assist in securing a suitable venue. At that point, just two weeks before the event, Minister Blair informed Stephanie that the format of the meeting would not be a Town Hall style as expected, but rather an invitation-only, one-hour, closed-door, sit down discussion with very limited space around the table. Despite the overwhelming response to the consultation – or perhaps because of it – Minister Blair communicated to Stephanie that she would be permitted to invite only five individuals to join her in the room on January 23rd. After pointing out how disappointing this was, Minister Blair revised that number to ten. Deeply disappointed by the Minister’s choice not to hear from as many stakeholders as possible, Stephanie encouraged constituents to send her written statements that she could bring with her to the consultation and hand to Minister Blair. On the day of the Calgary consultation, all ten of Stephanie’s invitees braved a blizzard in the middle of the work day for the opportunity to express their feelings on Blair’s recently passed Bill C-71, (“an Act to amend certain Acts and Regulations in relation to firearms”) and looming legislation surrounding the banning of handguns. Those around the table included knowledgeable representatives from Alberta Tactical Rifle Supply, a retired veteran and firearms officer, two University professors (one of whom is a noted gun collector and regional director of the Canadian Shooting Sports Association; and the other, an Order of Canada recipient), a criminologist, and a cyber security expert, specializing in confidentiality of records. Participants made the most of the 60-minutes available to them, discussing the effects a handgun ban would have on information privacy, civil liberties, manufacturing, and business investment. The message was clear: this is viewed as yet another legislative tool to punish responsible and law-abiding gun owners. The Minister heard loud and clear opposition to Justin Trudeau’s methodology for reducing violent crime. Stephanie herself questioned whether the outcome of the consultation will ultimately reflect the views expressed by the stakeholders consulted. Minister Blair, when pressed, agreed to accept additional submissions in writing to his office, to be coordinated by Stephanie. Grateful for the opportunity to attend, yet undoubtedly dissatisfied by the Minister’s responses, attendees left the meeting without any assurances. 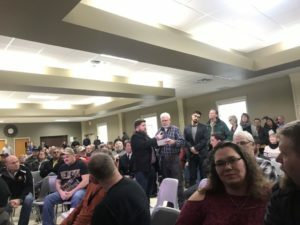 Several days after the Calgary meeting, a video clip of Blair’s consultation in the riding of Bruce-Grey-Owen-Sound was published to Twitter, showing what appears to be a spacious room filled with hundreds of participants. 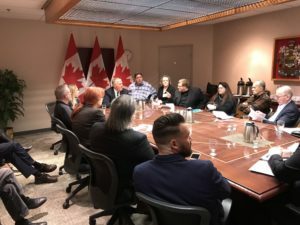 Getting a glimpse into that meeting certainly begs the question of why the Minister insisted on an exclusive gathering in Calgary, but opened up the consultation in Ontario. Feb. 3. 2019 consultation in Durham – at Durham Community Centre. Photo courtesy of Tracey Wilson. Stephanie forged ahead with the collection of submissions as promised. After making a callout to stakeholders, she received feedback from over 40 individuals, which she delivered to the Minister’s office. However, with rumours circulating that Blair’s forthcoming legislation will be announced imminently, she is not confident that the Liberals will invest the time necessary for a sufficient review of these submissions. It’s clear that these “consultations” are another misfire on behalf of the Trudeau government to listen to law-abiding, tax-paying citizens. Instead, they continue to push an ideological agenda disconnected from average Canadians. Stephanie and her Conservative colleagues will continue to monitor the Liberal Government and press them to follow the evidence and data, rather than simply blindly implement another one of the Prime Minister’s ill-advised policy changes.